I’ve had a lot of hits on my recent Little Red Riding Hood blog so here’s m ore on the belief in and persecution of men thought to be werewolves in 16th Century France. Fear of werewolves was very real in the middle ages (1). 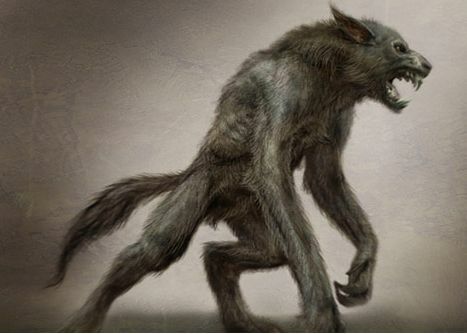 In France between the years of 1520 and 1630 over 30,000 people are recorded as being suspected of being werewolves. The accused were overwhelmingly men (a female accused of being a werewolf was called a lupin) and they were arrested, interrogated tried and frequently tortured into giving a confession. There are many similarities between their treatment and the treatment of witches during this period (2). cereal crops and contains chemicals similar to Lysergic Acid Diethylamide or LSD (5); a powerful hallucinogenic and psychoactive drug. 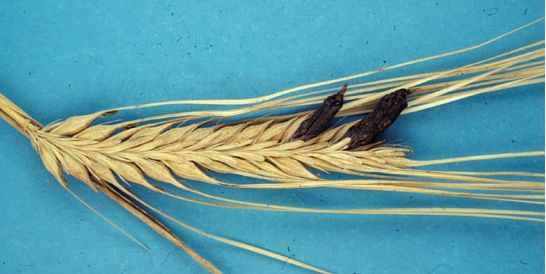 Also, people who ingest food contaminated with Ergot report having horrible visions that include being attacked by, or turning into, vicious animals ~ was Ergot the ingredient used in Jacques Roulet’s family salve? Roulet’s account stated that his brother, Jean, and his cousin, Julien, were also werewolves and that the three of them would often go out hunting women and children together. Roulet was sentenced to death on the grounds of murder, werewolfism, and cannibalism. He eventually appealed to the Parliament of Paris (6) and his sentence was revoked and reduced to two years in a mental institution on the grounds that his testimony was taken under duress and during a time that he was not of a sound mind. Mental illness may account for Roulet’s behaviour, but, as far as I’m aware, he never made any claims such as making a pact with the devil, etc as other Europeans accused of werewolfism had done. Today, Lycanthropy is used as a psychiatric term used to describe an individual who believes he or she is, or has transformed into, an animal and behaves accordingly. The term Clinical Lycanthropy is also used in order to distinguish it from its use in werewolf legend. Personally, I tend towards the theory that he (and his brother and his cousin) got occasionally high on LSD and this accounted for his belief to be a werewolf. (2) At the beginning of the seventeenth century the punishment of witchcraft was prosecuted with full vigor by English authorities who regarded “warwoolfes” as victims of delusion induced by “a natural superabundance of melancholic”. The persecution of witches by the English state only declined after the Protestant Revolution of 1640-48. The wolf itself became extinct in England c1680. (3) Angers is situated on the Loire between the major towns of Samaur and Nantes and in the period being discussed it was the capitol of the Anjou Region. The people of the Anjou Region were known as Angevins. They gave their name to the family of Geoffrey Martel, who took control of the Touraine in 1044. (4) Interestingly Huguenots had succeeded in taking over Angers in 1585. Huguenots were French Protestant Calvinists found mainly in southern and central France and at their height represented about one in nine of the national population. An important driver of their anti-Catholic Church stance was being against the Catholic Establishment’s obsession with death and the dead. So, I wonder, what was their role in the Roulet affair? (5) LSD was finally isolated in 1918 by the Swiss chemist, Arthur Stoll and then further developed by the Swiss drugs company, Sandoz. Post World War II it was used in the USA, England and mainland Europe as a therapeutic treatment for psychiatric patients. (6) During the period under discussion, the Parlement of Paris dealt with civil law matters over the major part of northern and central France. It is interesting that a reportedly poor man such as Roulet gained access to this court. Who were his local supporters and legal advisors? Were they Huguenots? Roulet could well have faced further torture by the Parlement as its practice was commonplace and, in fact strictly codified. Torture of suspects and cruel methods of executions were only abolished in France in 1788. This entry was posted in Angers, Off the wall historical stuff and tagged Angers, ergot, Jacques Roulet, Loire Valley, Loire Valley History, Lycanthrope, Lysergic Acid Diethylamide, Touraine History, werewolves, witchcraft. Bookmark the permalink.